eh, thats what I said when we first started looking, but its not worth turning down a house you love everywhere else, and at a great price, just because it has a nook. If you really don't like them you can just frame and drywall over them for the cost of materials (dirt cheap) and a little manual labor. In other words, its not worth giving up a house you love to avoid 1 days work. 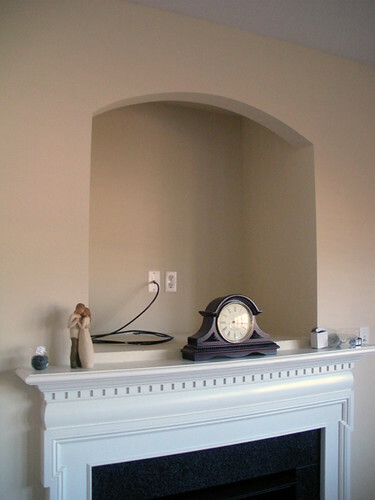 I could do that and be done with it, but I thought it would be more interesting to do something different with it, other than the drywall and then just hanging a picture over the mantle. My husband worked with someone who actually installed his flat screen TV that was too large for the nook *in front* of the nook by using a full motion TV mount. He then put shelves in the nook under the bracket and would just swing the TV out of the way whenever he wanted to snag a DVD. His receiver/tuner sat on the fireplace shelf just under the TV. It was actually pretty sweet and didn't take much more work than any other flat screen TV installation. About to start installing laminate floors on our entire first floor...have any of you done that? We have vinyl, carpet, and exiting hardwood...I'm thinking it would be easiest to install over the wood and vinyl, and rip up the carpet. If you rip out the carpet, you're installing to the subfloor. Your existing hardwood (you're going over that?) is on the subfloor, so is your laminate. You'll have 3 different heights to worry with, IMO. With ours, removed everything and started from the subfloor. But I was installing actual hardwood and nailing down. I don't know what method you're planning to use. I mean, it can be done. 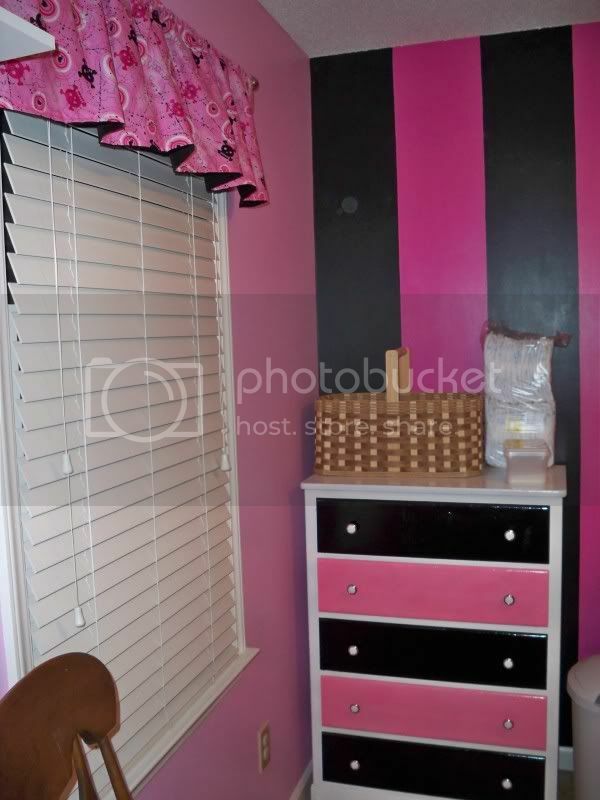 You'll just need to use transition strips. Especially if removing everything else adds a significant amount of time and pain in the assedness. The easy part for us with removing our flooring was that there was particle board laid on top of the subfloor. So all we had to do was remove the particle board and go from there. I'm assuming the flooring you have now is 3/8" thick? Your laminate is how thick? I'm just wondering what you're transition would be...you could probably get away with the laminate part. But the hardwood would be interesting to see. Also, you could use some form of underlayment to bring the height up some. Lots of ways to about this. right next to the cable jack which is hidden behind the entertainment center anyway. The TV sound can be run throughout the whole house if I wanted, but I am mainly using it to hookup my iPod and my record player so that they will play throughout. Really, really enjoying it. Such an awesome perk in the new place. Since it was already installed and wired my only cost was the little bit of wiring, an old work electrical box, and the wall jack which was a total of like $20. 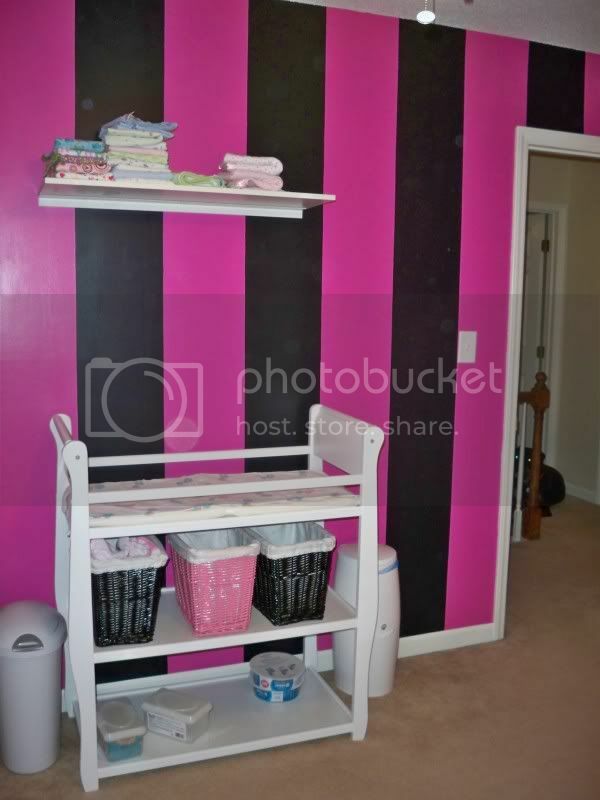 The only projects we've done so far in our new house: putting up the stockade fence, painting Tessa's room. I like it. 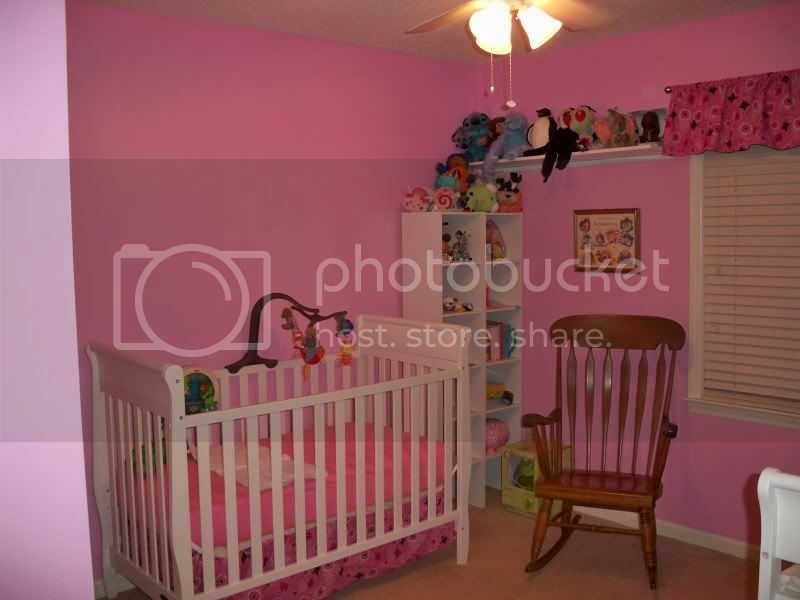 It's the kind of color that will grow with her, and won't always look like "baby girl pink." 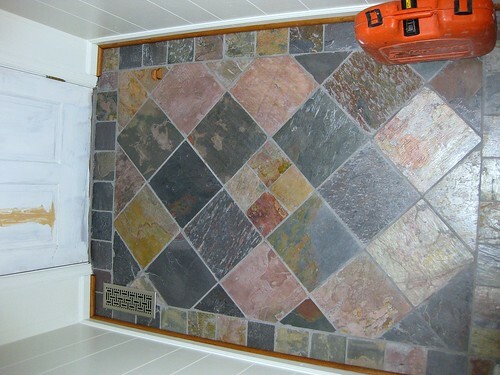 Mostly done with the "slate in the foyer" project. A small piece of baseboard in the corner broke when removing the subfloor, so I have to replace that before nailing the last piece of quarter round, hence the finish nailer. I also need to paint the door and put down the transition strip. Other than that, done. 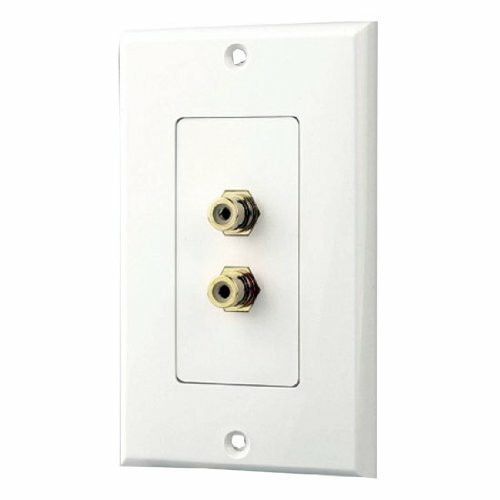 I just put in some in-wall speakers. Look sweet! Previously just had the old tiny speakers mounted on the wall with the cord showing and ugly. I decided it was easier to cut a chunk out of the wall to feed the wire and boy was I right. Now it's time to put in the ceiling one's. It'll be a piece of cake though. Thanks Bobby...really wasn't too bad. The most difficult part was pulling out the plywood. After that it was just finding the center and going from there. I used the Behr paint with the primer and thought it did an excellent job just like the exterior version of it I used on our door and shutters. 1 coat for true color with no bleed-through. I painted the dining room this weekend. One color on the bottom 1/3 and 2 shades lighter on the top 2/3s. The chair rail in this room and the reading room is going up this weekend. have fun! we did the downtown raleigh alliance home tour this past weekend so my wife made me finish it all. i am kind of glad we were on the tour because all outstanding projects were forced to be complete. ^I love love love your house. ^ That is exactly the kind of thing my wife and I are doing in our reading room. But I do agree that what he did looks good too. I had to. It was the only "before" one I found on my computer. ^^^^&^^^^^ It wasn't that hard but I have been doing carpentry for 12 years now. 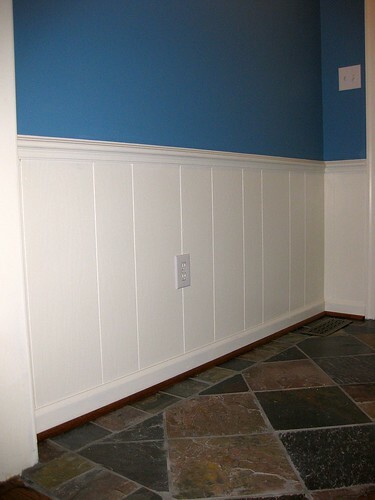 The board and batten is a little less formal than that style of wainscoting. What I did fits the style house I have. yea, I haven't really done any but my father-in-law has and he is bringing his miter saw. I think this weekend is just going to be the chair rail but as I said before, the picture frame molding is coming asap. We definitely don't have a very "formal" house but we are turning one room into a library/reading room and we are going for kind of a traditional look in that room. That is the room that the wall framing is going in and I think it will really work well with the design and the style in there. The rest of the house looks similar to yours: it is definitely up-to-date but isn't over-the-top modern/contemporary. well, scratch doing the rail this weekend. My father-in-law broke his wrist last night playing softball . Even though I've never worked a Miter saw before, I would gladly do all the work if he directed me since it would be good to learn, but I think he just wants to take it easy this weekend. chair rail would be a good way to learn the miter box. i am going to texas this weekend. if i wasn't we could work on it. 1. replace dining room hanging chandelier light with different light so that we don't run into it. 3. repair doorjam to master bedroom (door won't close completely, the latch isn't catching. ^sounds exactly like my first few projects when we moved into our new house, lol. lol, they are the projects resulting from a recent move into a sweet townhouse. tv mount installed, wires ran behind wall/baseboard over to tower, center speaker mounted, was going to mount left and right but they are too thick, didnt look right sticking out from wall. Holding off on doing that until (and if) I get smaller speakers. nice, that looks pretty baller. ^^ your bookshelves appear to be on the verge of falling over. okay, how hard was it to run the wire through the wall? Did you just cut a hole, feed them down to the baseboard and run them over behind the baseboard to the unit? ^ Go buy 2 low voltage cut in boxes from lowes. in the same section they have these neat little plates that you feed your wires through. 2. cut one hole at the bottom in the sheetrock right below hole number 1.
disclamer: it is against fire code to run the electrical cord behind the wall so do that at your own discretion. ^ aha, i definitely did that to put an outlet up high for my wall-mounted TV. 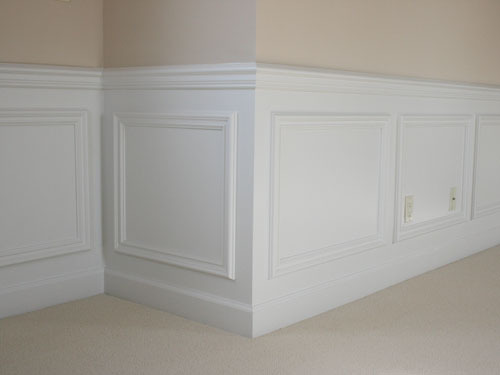 "chair rail would be a good way to learn the miter box. i am going to texas this weekend. if i wasn't we could work on it." just saw this. I really appreciate the gesture, but I live in Greenville, SC these days. Probably a little too far for you to drive to help me put up chair rail haha. my wishing well project i have been working on this month. i'm almost done with it. i want to add a bar or something to wrap a rope around and hang a bucket (with some flowers or ferns planted). i built this wishing well to cover a septic tank pump cover that was about 1.5' above ground. cool project. ^ yea what he did was what similar to what I was talking about doing a few pages back. i think I am going to go with no vertical shelves and just 2 or 3 horizontal shelves and leave it a little more open and just have some books and some pictures on it. Basically the only thing I want on my mantle is our mantle clock and 1 or 2 other items period. Then everything else we could have on the shelves in the nook. This is a picture of a couple weeks ago right after I painted our accent wall in the living room (and before I cleaned up from painting and the remnants of eating while painting ). Also a before picture at a better angle to see the nook. Still thinking of accent lighting on the inside of that top arch too. mantel project i did about a month ago at the house. i got a little help for the little guy on this project.